067. S.S. "TERRA NOVA." Issued by Duncan & Co. (1925). 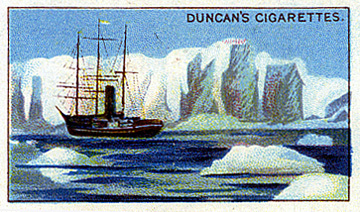 Unnumbered card from a set of 50 entitled "Evolution of the Steamship". Size: Ca. 2.5" x 1.52". Recto: View of Terra Nova with high ice barrier in background. Upper right: DUNCAN'S CIGARETTES.